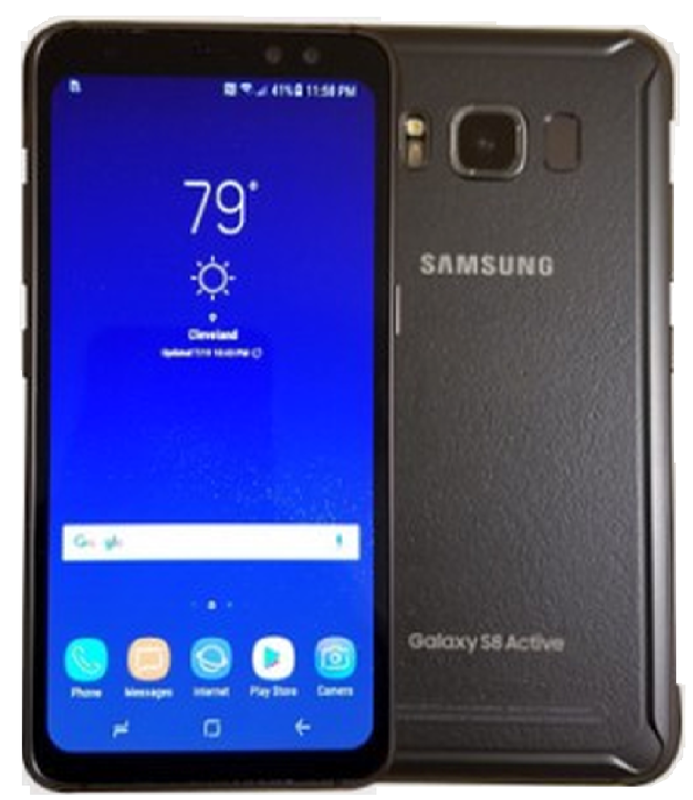 The Status bar at the top of the Home screen provides Samsung Galaxy S8 Active device information (such as network status, battery charge, and time) on the right side and notification alerts on the left. 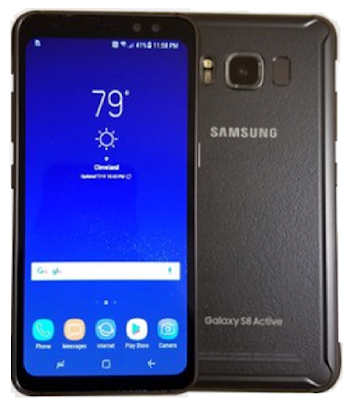 Battery charging Learn how to charge Galaxy S8 Active. 1. From a Home screen, pinch the screen. • Align shortcuts: Tap Align to move all apps shortcuts into a line at the top of a screen. • Remove a screen: Tap Remove. • Set a screen as the main Home screen: Tap Main Home screen at the top of a screen. This screen is displayed when you tap Home. • Change the order of screens: Touch and hold a screen, and then drag it to a new position. • Add a screen: Swipe to the end of the screens, and then tap Add. 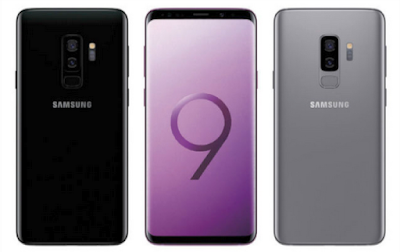 • Hello Bixby: Swipe right, and tap On/Off to enable. 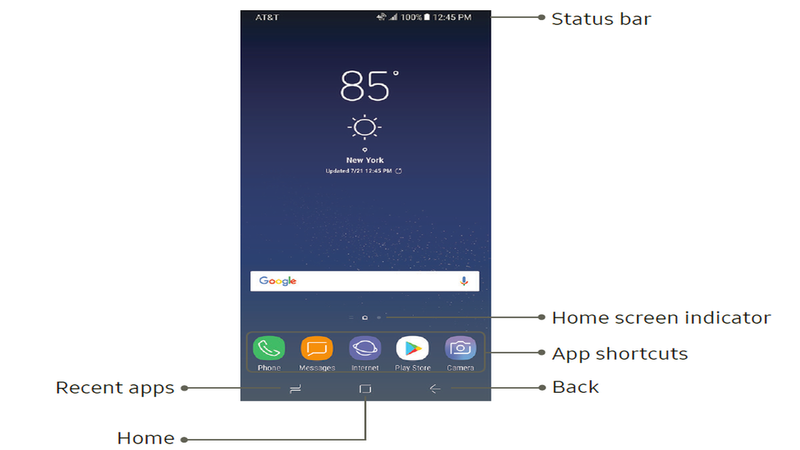 Set up Galaxy S8 Active visual themes for all system screens and icons on your device. Change the look of the Home and Lock screens with wallpaper. You can display a favorite picture or choose from preloaded wallpapers. 2. Tap Wallpapers and themes to customize. Widgets are simple application extensions that run on a Home screen. There are many kinds of widgets, including links to a specific contact, Internet bookmarks, Gmail and email accounts, special features and many others. 3. Touch and hold a widget, drag it to a Home screen, and release it. 1. From a Home screen, touch and hold a widget to open the options menu. • Removing a widget does not delete the widget, it just removes the widget from the Home screen. Customize your Home and Apps screens. Home screen layout: Set your device to have a Home and Apps screen, or only a Home screen where all apps are located. Home screen grid: Choose a dimension option to determine how icons are arranged on the Home screen. The numbers indicate how many icons can be placed horizontally by how many icons can be placed vertically. Apps button: Add an apps button to the Home screen for easy to access to the Apps screen. Hide apps: Select apps to hide, tap Apply. 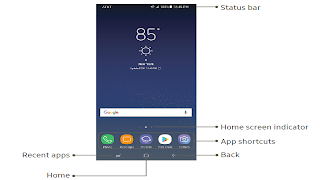 About Home screen: View information about the TouchWiz Home screen software. You can use app shortcuts to launch an app from any Home screen. 2. Touch and hold an app shortcut to open the options menu. 3. Tap Add shortcut to home. 1. Touch and hold an app shortcut to open the options menu. • Removing a shortcut does not delete the app, it just removes the shortcut from the Home screen. 1. Touch and hold an app shortcut to release it. 2. Drag the app shortcut to a new Home screen, and then release it. Place folders on a Home screen to organize items. You can create an app folder on a Home screen. 1. From a Home screen, touch and hold an app shortcut and drag it on top of another app shortcut until it is highlighted. 2. Release the app shortcut to create the folder. • Enter folder name: Enter a name for the folder. • Palette: Change the color. • Add apps: Place more apps in the folder. Tap apps to select them, and then tap Add. 3. Tap anywhere outside of the folder to close it. • To add more apps, touch and hold an app shortcut and drag it to the folder. You can remove a folder that you added to a Home screen. 1. Touch and hold the folder to open the options menu.